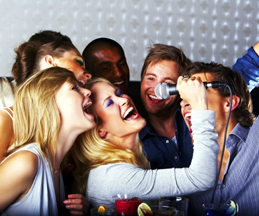 Karaoke - Add karaoke to any DJ system to see who in the crowd is a star in the making! Includes: DJ sound system, karaoke discs, song lists, microphones, speakers, speaker stands, and TV monitor. Space: 8'l x 8'w plus room for singers and audience. Related music rentals include: DJ, Portable Karaoke, Chrome A Zone Lights, Mini Oscillating Lights, Bubble Machine, Fog Machine, Dance Floor, and Guitar Props.